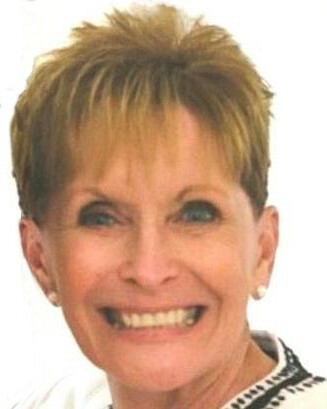 As the premier state conference for parks and recreation, forest preserves and conservation agencies in Illinois, the IAPD/IPRA Soaring to New Heights conference brings together more than 4,200 professionals and elected officials for three exciting days of quality educational programming, networking and professional development. Established to preserve Illinois' natural resources and protect and provide exceptional parkland and forest preserves for all Illinois residents to experience and enjoy, the Illinois Association of Park Districts (IAPD) has done just that since 1928. And the Illinois Park and Recreation Association (IPRA), incorporated in 1963, remains a national leader in cultivating tremendous opportunities in education and networking for diverse park professionals. Together, these associations protect and nurture Illinois' natural environment to ensure its stability and beauty for generations to come. One of the primary goals of the Joint Conference Committee is to provide high-quality, timely education that contributes to the service and professional development of the attendees with valuable resources and new ideas. Featuring over 150 educational sessions and workshops, and an exhibit hall where more than 300 exhibitors showcase their latest and greatest products and services, the 2018 conference is the place to be. The event presents an exciting opportunity for everyone in attendance to join together with fellow members of their field to share important information as well as provide networking and professional development opportunities. AmpliVox is stationed at Booth #222 showcasing our outdoor portable pa systems. 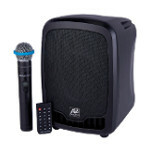 The Titan PA system can either be plugged in using AC power or run on rechargeable batteries. The Titan's lightweight design can reach up to 2500 people in room sizes of up to 10,000 square feet in optimal conditions. 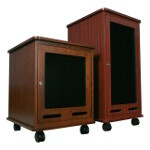 Half-Mile Hailer kits provide additional components such as horn speakers, 40ft. cable to connect the speakers, adjustable compact tripod that extends 28 to 49 inches, adjustable heavy duty tripod that extends 44 to 84 inches, Y adapters, and nylon carry case with luggage handle and wheels. Communicating in large open spaces to large crowds or small is never a problem with an AmpliVox megaphone. Our lightweight, battery operated megaphones / bullhorns are essential to your public address activities and emergency preparedness kit. Our new waterproof ProMarine model is built especially tough for marine and outdoor environments. From 3D printing to robotics, and assessment solutions to educational software, FETC’s Expo Hall will host more than 400 leading manufacturers — each featuring the latest technologies and newest products on the market. The 38th National Future of Education Technology Conference features industry experts and unrivaled agenda content, an Expo Hall filled with the latest and greatest solutions, and a community of thousands eager to network with like-minded peers. School and district administrators, classroom teachers, IT professionals, special education directors, curriculum and media specialists, and other educators with roles or interest in ed tech, attend FETC year after year to find the professional learning, technology solutions and connections they need to transform learning in and out of the classroom. AmpliVox Sound Systems will be attending the FETC 2018 Conference in Orlando, Florida Jan 23th - 26th. Visit our booth #1543 to learn how PAs like our new Classroom Audio System connect your classroom to a new world of amplified professional sound quality. 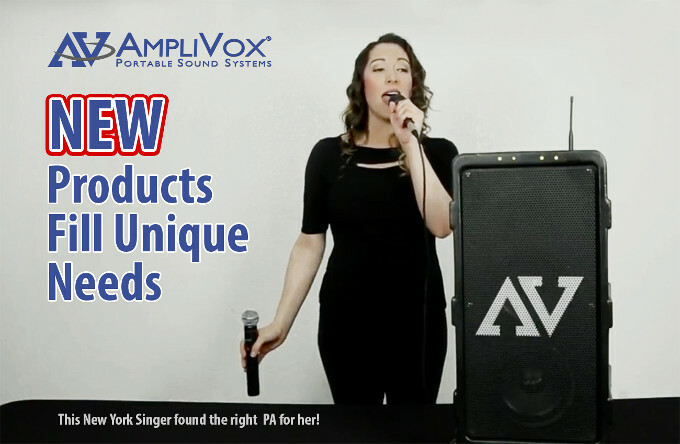 Get the AmpliVox Classroom Audio System with wireless microphone, it gives you the sound quality of a professionally installed sound without the cost of installation complexity. 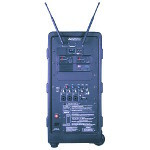 The microphone's receiver simply plugs into the mixer amplifier and the microphone can be used up to 50 feet away. The SW800 Titan Wireless Portable PA System with built-in Bluetooth® module allows a user to stream music wirelessly from any Bluetooth® music-playing device such as a smartphone, PC or laptop computer. 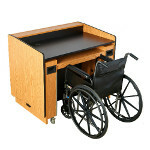 The ADA lectern, with wheelchair access, offers a stylish yet functional approach to ADA compliance that easily accommodates the mobility-impaired as well as the standing presenter. 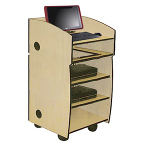 Moves smoothly and quietly from seated (31”) to fullstanding height (41”) allowing the same lectern to be used for all presenters. 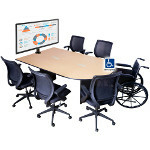 There is also an optional universal flat panel monitor table stand that accommodates NEC and other leading monitor brands. The Power Pod PA system packs 50 watts of power into a unit weighing less than six pounds, reaching an audience size of 300 people with crystal clear sound. The SW245 bundle includes Bluetooth® Plug-in Receiver and USB Wall Charger, a lapel microphone, headset microphone, bodypack transmitter and a handheld wireless microphone with built-in transmitter. 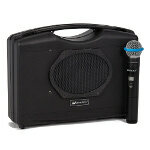 Portable, battery-powered mini PA system you wear like a belt, leaves you hands-free and comfortable. Keep your audience's attention and be heard clearly as you move freely around the room or to multiple locations—inside and outside and all over your venue. Save your voice with our belt worn personal sound system. Weather resistant cover keeps the unit dry and rechargeable batteries save you money. 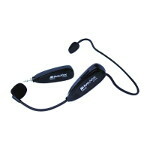 The AmpliVox S1697 is an easy to use and affordable Universal digital wireless headset microphone system. Its compact and lightweight design is a great solution for expanding your audio needs. Plug receiver into any audio device (microphone / line in jack) with a speaker and amplifier and start talking. The Mity-Lite Plus compact portable PA system weighs only 8 lbs and allows maximum portability with its small, compact design. 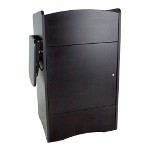 You can carry it or set it on a tripod to use for powerful and clear sound that this system offers. Communicating in large open spaces to large crowds or small is never a problem with an AmpliVox megaphone. The Lithium-ion battery pack delivers up to twice as much operating time as standard batteries with no memory effect; recharge whenever you like. The battery charger is built-into the battery case with LED charge status indicator and automatic charge protection that stops charging when battery is completely full. The Executive Sound Column Lectern fits well in any decor with its modern styling and easily glides from room to room on 4 easy-glide casters. 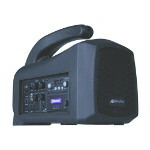 Wireless sound system fills the room with rich sound making sure your message is heard loud and clear. Modern styling that fits well with any decor, the sensitive AmpliVox electret condenser gooseneck hot mic picks up your voice from up to 20" away.